Jennifer Bridges, PMP, has been an entrepreneur and business owner for about 20 years. In that time, she’s learned plenty about crafting successful growth strategies for businesses, which she shares in this video. As mentioned, Jennifer has been an entrepreneur and business owner for a long time. She said she’s seen her fair share of successes but admitted to failures as well. But it’s these experiences—both good and bad—that taught her the best strategies and tools for enabling business growth. Establish a Value Proposition: What are you good at that serves a need in the market? Identify Your Ideal Customer: Not everyone is a customer, so to successfully market, you need to target the right profile. Define Your Key Indicators: Be sure there’s a need that isn’t being served and which you can grow to take advantage of—before you make the move. Verify Your Revenue Streams: See where you’re successful, where you’re not and what opportunities might be present. Look to Your Competition: They can give you a canary in the coalmine view of the market and whether it can sustain growth or not. Focus on Your Strengths: Be sure your strengths as a company are aligned with the areas of growth you’re targeting. Invest in Talent: If you’re going to grow, then you’re going to need talent to help you do that. What if you’re an entrepreneur, how do you develop a winning strategy for growth? Jennifer had a handful of areas to exploit. Market Penetration: Enter a new market. Market Expansion: Exploit growth potential in an existing market. Product Expansion: Develop products that have potential to grow. Diversification Strategies: Grow by diversifying your offerings. Acquisition Strategies: Grow by acquiring other businesses or services. Be willing to change with the times. If you’re stuck in old ways, you’ll be left behind when times change, and times always change. Learn how to manage change in your organization. Make innovation one of your strategies, because things change, and the only way to stay on top of that change is by never becoming complacent. Focus on customer relations, as your strategy is useless without positive engagement from those who use your product or service. Give back to the community because they’re your customer base. It’s the right thing to do, and it builds relationships, which strengthens the bond to your brand. Pro-Tip: In order to grow, you must have a business case. This document helps sell your idea to stakeholders and helps with solidifying the strategy as a sound investment. 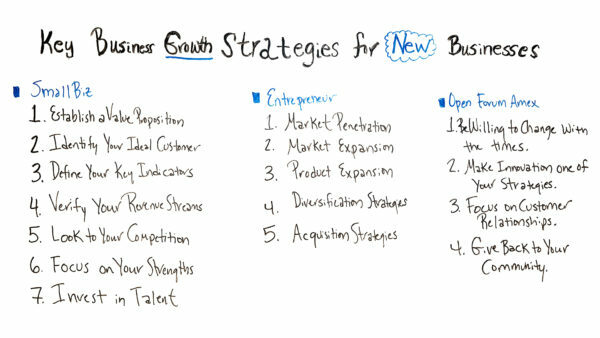 Today we’re talking about key business growth strategies for new businesses. Well, being an entrepreneur and business owner for going on 20 years now, this topic is near and dear to me. Although I’ve had some grand successes, I’ve had some epic failures and costly lessons learned. So today what I want to do is share my three go-to resources for not only information, but strategies that work. So the first one I want to talk about is by SmallBiz. There are some steps that they have, kind of, if you look at these, maybe in a startup mode or starting, but growth as well. So first of all, you want to establish a business proposition. What value are you offering out there? What are you good at doing and how can you serve a market need? Number two, identify your ideal customer. Sometimes people think that everyone is a customer, but the more you can narrow it down to a specific customer, their profile, their buyer persona, things that they’re really interested in, and the issue or the problem that they’re having. You also want to define your key indicators. How do you know that that you’re ready for growth? How do you know that this is an area for you? How do you know that you can really serve this and how do you know that the customers are even needing or asking for this? You also want to verify your revenue streams. What revenue streams do you have? Which are very successful? Maybe, which ones do you need to let go, shut down and have an opening for other areas? This will also give you an idea of maybe where some gaps are. You may see where you do have an opportunity to add some new services. You also want to look to your competition. So for this, you want to look at…what are they doing? What are they doing well? If their business is growing, maybe there’s still a market share for you to go in and offer a service or product. So understand what your position is and where you fit into that market. You also may want to see, you know, maybe look at your competition, maybe their areas of business if they’re shutting down. So if they’re shutting it down, it could be for a reason, like, is the market not there, maybe the demand isn’t there anymore. So you don’t want to go into or launch, a growth strategy for an area that’s the market is almost dying. You also want to focus on your strengths. So you can have a growth strategy to launch new revenue streams, products or services, but if that’s not your strength, it could be an opportunity for you to have lessons learned and actually lose. And then the seventh one is you want to invest in talent. So if you’re growing in certain areas, you know, what kind of talent do you need in order to support that? So here’s another one. One of my favorites is Entrepreneur, like Entrepreneur Magazine, Entrepreneur Online. But here are five strategies. So think of this is, again, maybe you’re growing and you’re looking, you’re new, but you’re also looking to grow in different areas. So there’s our look at market penetration. So what this is, is maybe you have a specifically defined market and you want to go deeper into that specific market. This one is market expansion. So maybe there’s an area or market that you have in your servicing them well, but maybe you can go out to other verticals, other markets to serve as well and then also product expansion. So say if you’re a technology company and maybe you offer software, maybe there’s an opportunity for you to offer, you know, hardware or some kind of online platform or some kind of training for your software, so that gives you an opportunity to develop other products. Also, diversification strategies. Sometimes, using technology as an example, so if you’re a software company and maybe there’s a lot of competition, you may want to diversify, again, by a diversification strategy. Maybe you need to get into the training people how to use that software, so you don’t leave yourself in jeopardy if a lot of competition comes in or that specific product or service, the demand dies or reduces. So also an acquisition strategy. So you can grow by acquiring other companies. Back to the example of technology. If you’re a software company and say maybe there are other smaller companies who are also software that’s may be either the same as what you provide or maybe it’s complimentary, then you could acquire another company. So those are some strategies, and then I love this one. This one is OPEN Forum by American Express. So these are four points that they say have kind of stood the test of time. They’re almost like best practices to consider for growth because it is said that if you’re not growing, you’re dying. So the first one is, always be willing to change with the times. Sometimes companies want to hang onto products or services that they’ve been really good at, but the market dies down but they want to hang on. So you gotta be willing to let those things go and begin evolving with the times. Number two is, make innovation one of your strategies. So always looking ahead, looking ahead and considering you know where the market’s been, where the market has potential to grow and being able to provide other innovation, other new ways of doing things that could really change the game. Also, focus on customer relationships. The tighter, the stronger your customer relationship is, they will many times let you know how and where to grow your business. So if your customers keep asking for certain things, then sometimes if you follow what they’re asking, they can help guide you where you need to grow. And the fourth one is, give back to your community. By being visible in your community, you just make more relationships. There is a lot, you know, what you give many times comes back. So these are three of my favorite resources for strategies for growth and if you need a tool that can help you with your growth strategies, then sign up for our software now at ProjectManager.com.